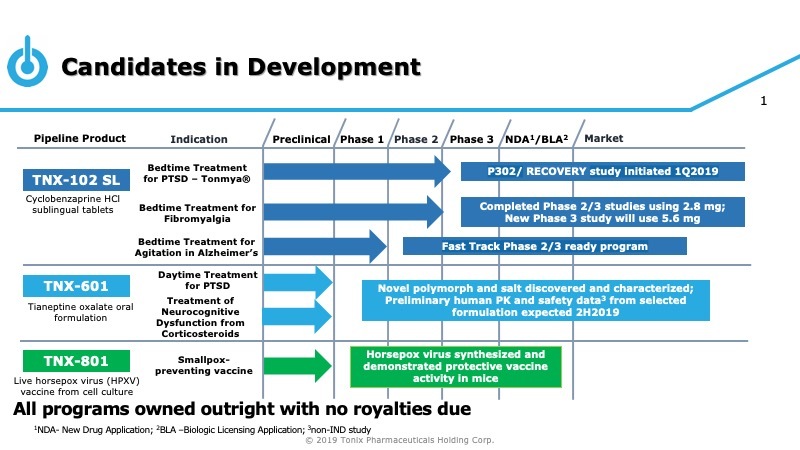 Tonix has a robust pipeline that includes promising drug candidates targeting different therapeutic areas in various stages of development. Our lead product, TNX-102 SL, takes an innovative approach, improving sleep quality, to potentially address a constellation of disorders in a variety of therapeutic areas where sleep disturbances are central symptoms and are believed to have a role in the onset, progression and severity of the disorder. TNX-102 SL (referred to as Tonmya®*) is in Phase 3 development for the treatment of PTSD, for which sleep disturbances are recognized as core symptoms. The same product candidate, TNX-102 SL is also being developed under a separate IND for agitation in Alzheimer’s disease. Currently, there are no FDA-approved treatments for agitation in Alzheimer’s disease. TNX-102 SL for AAD has been granted Fast Track development status by the FDA. The IND has sufficient data to support a Phase 2 potential pivotal efficacy study in AAD patients. AAD is another condition where sleep disturbances are also considered to play a central role in the pathophysiology.